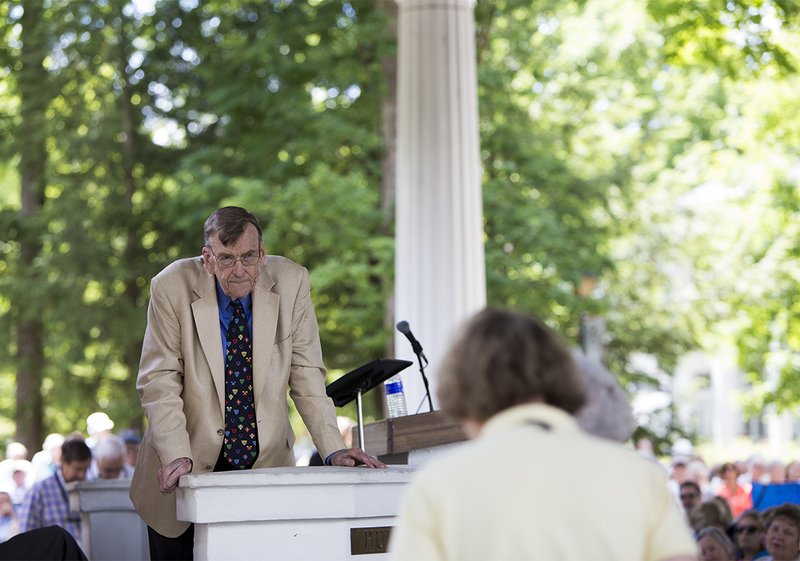 In the final moments of the last lecture of his weeklong series, “Biblical Literalism: A Gentile Heresy,” retired Bishop of Newark John Shelby Spong called for adherents of his figurative view of Scripture to treat their fundamentalist friends and family with compassion. He called religion a security shell that people have to drop themselves; if someone tries to tear it off with an argument, he said, they will only become hostile. Spong’s plea came after arguably his most controversial lecture yet. It concerned the seminal image of Christianity, that of Jesus nailed to the Cross, and the crucifixion story that Spong said takes up 25 to 40 percent of each Gospel. Spong did not suggest that the crucifixion never occurred — as he did last week for the Virgin Birth, the Sermon at the Mount and the entire lives of Joseph and Judas. He simply argued that everything surrounding it — his last words, his argument with the thieves, the repentant soldiers, his prayer in the garden of Gethsemane, his trial with the Sanhedrin, all of it from the moment Jesus is arrested — is fictional. Spong’s reasoning is simple: there were no actual eyewitnesses to the crucifixion. Jesus, Spong said, likely died alone. If that is the case, then where did the Gospel writers get the Jesus narrative? Applying his thesis that the early Gospels are Jewish books written for a Jewish audience, Spong argued that Matthew sketched much of Jesus’s final moments to fulfill an image set forth in the second book of Isaiah and dramatized in Psalms. Although the Gospel of John writes that the disciples kneeled at the foot of the cross, Matthew and Mark, which predate John by about 30 years, both say the disciples fled when the Romans came for Jesus. The only witnesses to the crucifixion in the early Gospels are old women who were too far away to hear anything Jesus would have said. In the second book of Isaiah, written hundreds of years after the first, the Jews have just returned from exile in Babylonia, hoping to rebuild their temple and serve their biblical duty as a light unto the nations. But they are shocked to find that Jerusalem is actually in ruins and the people who moved in since the Jews left were not welcoming. One man falls into despair and casts a new vision for the Jewish people, in a segment of Isaiah’s book known as the “Songs of the Suffering Servant,” in which God’s servant, Spong said, could take all of anger and hostility in the world and return it with love. Nevertheless, Spong said, it was written down and centuries later became popular among Jesus’s followers. Jesus’s final words as relayed in the Book of Matthew, Spong said, are copied almost verbatim from Psalm 22, which itself is based on the “Songs of the Suffering Servant,” to prove that Jesus was indeed the Messiah. Spong said Matthew likely not only stole from the Psalm, but also from the original Isaiah passages. The story of the soldiers lashing Jesus, he argued, comes from Isaiah 53: “He was despised and rejected by man, a man of suffering and acquainted with griefs … He was wounded for our transgressions … with His stripes we are healed.” Spong argued the image of Jesus dying beside two unnamed thieves comes from a passage in Isaiah that reads, “he was numbered with the transgressors.” Jesus remaining silent before the Sanhedrin, Spong said, is drawn from the servant being “silent before his accusers” in Isaiah. Spong went on to list sources for the figure of Joseph of Arimathea, Jesus praying for the soldiers, and for the Romans dividing his clothing through lots. “When we discover that almost every detail of the Passion narrative as we know it was derived not from an eyewitness account, but from the Hebrew scriptures written some 500, 600 years before the life of Jesus, then we can no longer suggest this narrative is history,” Spong said. Yet rather than stripping meaning from the Scriptures, Spong argued that realizing the Gospel is not literal actually adds new and profound dimensions to the Jesus story. The details are important. What matters, Spong said, is the holy presence his followers saw in Jesus and attempted to convey through Scripture, a presence that — like the original servant in Isaiah — could return anger and hostility with hostility. Spong argued Matthew was trying to convey a message that every person is worthy of love.